Promo Period is from September 15, 2016 to October 12, 2016. 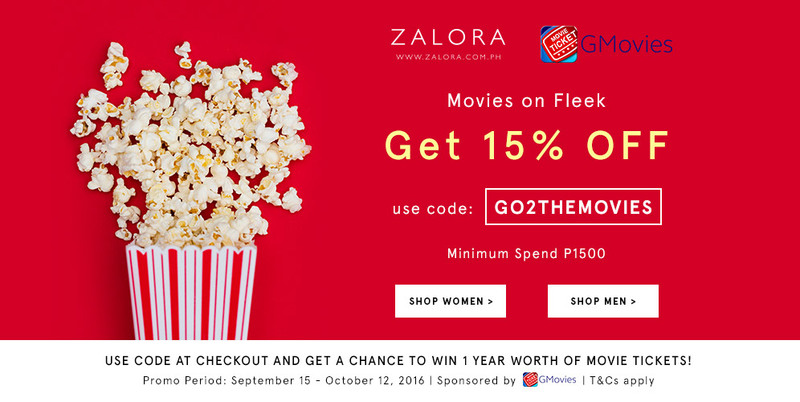 Using the code GO2THEMOVIES allows the customer to enjoy 15% off on the purchase in ZALORA with a minimum spend of Php 1,500 from September 15, 2016 – October 12, 2016. Each transaction will qualify the customer to one (1) raffle ticket. Must not be an employee of ZALORA and GMOVIES, and their relatives up to the second degree of consanguinity or affinity. Deadline to earn a raffle entry to the raffle draw is as October 12, 2016 at 11:59 PM. By purchasing from ZALORA, customers agree for ZALORA to collect their information for the purposes of contacting them regarding the raffle promo. The promo organizers’ decision with regard to the Promo Mechanics, winners and prizes, with the concurrence of DTI, is final. One (1) winner of one (1) year worth of movie tickets from GMovies; equivalent to one (1) ticket per week, for fifty two (52) weeks, valued at Php 300 per ticket. Ten (10) winners of two (2) movie tickets each, valued at Php 200 per ticket. A winner can only win once during the duration of the campaign. Raffle draw will be held at the ZALORA Philippines head office at B7 Bonifacio High Street, Bonifacio Global City, and Taguig on October 17, 2016 at 4:00 PM with the presence of representatives from GMovies and the Department of Trade Industry (DTI). The winner’s tax and any other related expenses relative to receiving the prize shall be shouldered by the winner. The raffle prize may not be converted to cash. ZALORA reserves the right to verify the eligibility of the winning entry. The winner’s order should be a valid complete order, with no cancellations, returns and refunds. Raffle draw winner will be notified by ZALORA through registered mail. ZALORA will also notify the winner via email and telephone call. Upon claiming his/her prize, winner must present the registered mail and two (2) valid forms of identification or government-issued I.D. (SSS, Unified Multi-Purpose ID, Driver’s License, Voter’s ID) and proof of citizenship (valid Passport or Birth Certificate). By participating in the raffle, the winner agrees to cooperate with and participate in any advertising or publicity activities of ZALORA and GMOVIES relating to the draw. The winner agrees that ZALORA and GMOVIES may publicize the name and photograph of the winner in such mode and manner as ZALORA and GMOVIES consider fit. The winners’ name may be published on ZALORA and GMOVIES’ website & social media channels - ZALORA: Facebook (https://www.facebook.com/ZaloraPH), Instagram (https://instagram.com/zaloraph/), and Twitter (https://twitter.com/zaloraph). GMOVIES: Facebook (https://www.facebook.com/GMoviesApp), Instagram (https://www.instagram.com/gmovies/), Twitter (https://twitter.com/GMoviesApp) and website (http://gmovies.ph/). The links provided are not exhaustive and there may be other publicity channels.